When I first reviewed Takashi restaurant back upon its opening in May of 2004, I was very enthusiastic about Takashi Gibo’s namesake restaurant. In fact, I recall arguing that the food there was every bit as worthy of the accolades that Nobu in Las Vegas – which I’d also recently visited – tended to receive. I had first met Takashi when he was a sushi chef at Shogun restaurant on Main Street and had become quite enamored with his talents. Fast-forward 14 years and we’re all a bit older (Takashi recently became a grandad) and, hopefully, wiser. 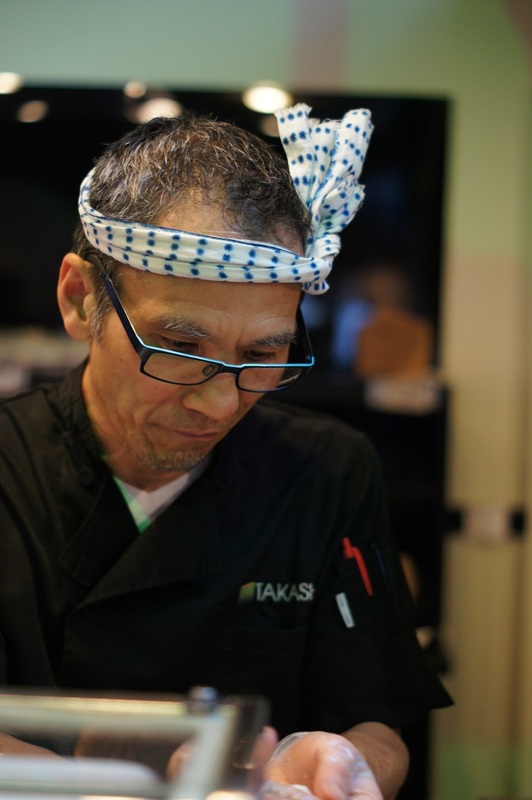 He and his wife Tamara, assisted by a highly-trained, uber-professional staff, still operate Takashi and there isn’t an evening when the restaurant opens that there’s not a throng of customers lining the sidewalk outside at 5:30, awaiting a prime table or coveted sushi bar seat. Recently, my wife and I waited in that line and were lucky enough not just to score sushi bar seats, but to have Takashi prepare omakase dinner for us. You do not have to be a food writer to receive the omakase treatment. I’m told that the Japanese term omakase means “I will leave it to you.” When you eat omakase style at a Japanese restaurant, you’re allowing the chef to choose what to serve you, and he or she will take into account dietary restrictions, likes and dislikes, etc. Some restaurants have a set price for omakase dining; at Takashi, you’ll give your chef a price range and they’ll prepare a multi-stage meal based on your budget. We told Takashi we had $100 to spend (for two) and we were stuffed before we got near that amount. So, omakase needn’t be expensive. Takashi has a steel trap memory. And so, without asking for it he began preparing one of my favorite sushi items: ankimo. This is a delicacy that tastes much like foie gras, albeit more subtle. 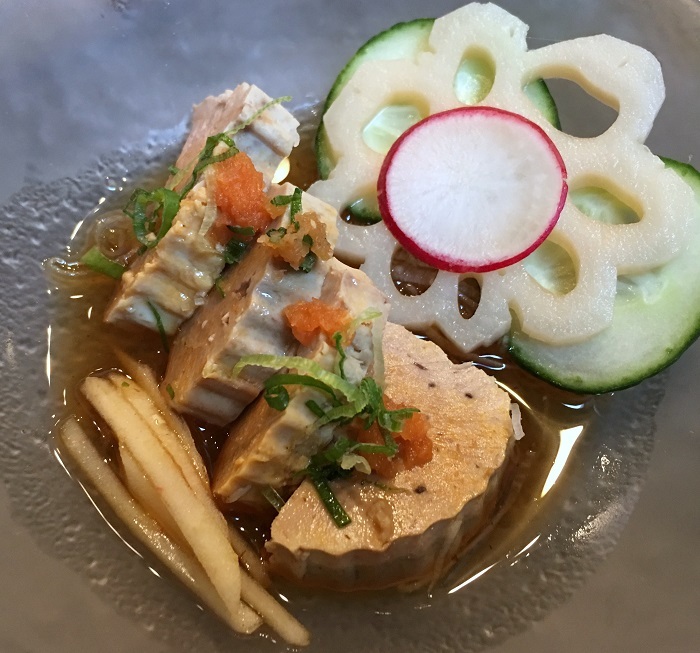 It is monkfish liver that is salt-rubbed, rinsed with sake, and then rolled into a cylindrical shape and steamed. Takashi served the ankimo salad style with fresh daikon, cucumber, radish, tobiko and scallion. It was divine. 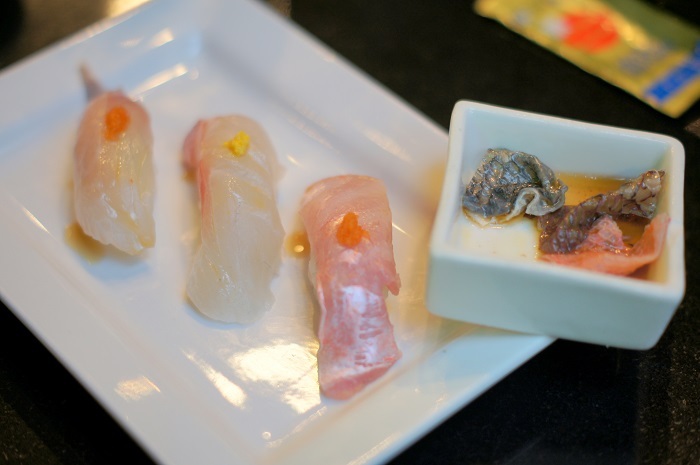 Next up was a nigiri trio of madai, black tai, and kinmedai. Although it’s frequently called snapper, madai is actually sea bream found in Japanese Pacific waters. It’s considered a luxury fish in Japan and has a clean, sweet, delicate flavor. Kinmedai – a close cousin to madai – is also called golden eye sea bream or snapper. The tender texture is a little different from madai, but it’s a lovely fish, just fatty enough fat to melt in your mouth. Alongside our nigiri was a special (and surprising) treat: fish skin. Takashi removed the skin from the nigiri fish we were served, cut it into bite-size pieces, and served it bathed, quite simply, in rice vinegar. “It’s my favorite part of the fish,” said Takashi. And I have to admit, my wife and I agreed. I now consider it a high crime when I see sushi chefs throwing fish skin into the trash! 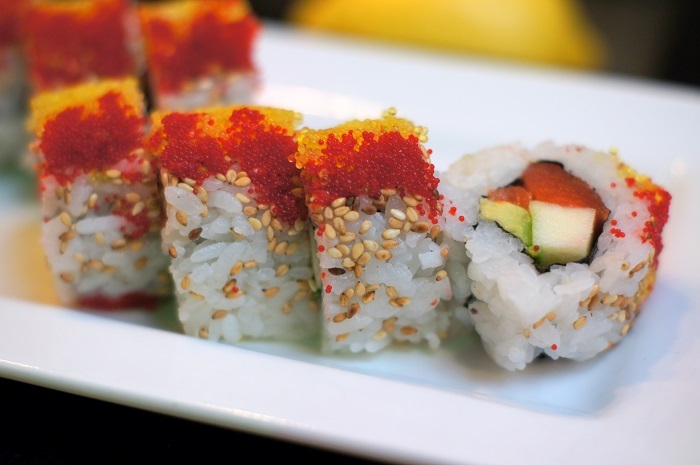 It’s always a difficult choice at Takashi to select from the tempting array of sushi rolls – there are so many great ones. However, we requested a special roll that was on the menu that night, called an asayake roll. Asayake means “sunrise” in Japanese and this was indeed a bright, sunny-tasting sushi roll made with sockeye salmon, avocado, Fuji apple, habanero, masago (capelin roe), yuzu, and tobiko (flying fish roe), sprinkled with toasted white sesame seeds on top. It was beautiful to look at, and even better to eat! Always remember when you’re dining at Takashi – or any sushi restaurant, for that matter – to look at the daily “fresh” board. On any given day, a restaurant might have a certain fresh fish that they didn’t have the day before, depending on what the fish supplier ships to them. On the night we visited, for example, customers could choose fish specials like suzuki, iwashi, shima aji, firefly squid (a favorite of mine), sayori, iwana, kohada, blue fin tuna and more. Although all of the sushi chefs at Takashi are highly-trained by Takashi Gibo himself, and they are all superb chefs, many customers still like to have Takashi prepare their sushi. And why not? He’s not just incredibly talented, but he’s also a genuinely kind, generous and humble human being. 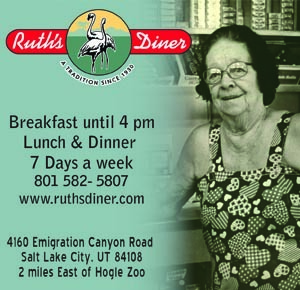 Not to mention, a very loyal Salt Lake Real fan – his son-in-law is Real defender Tony Beltran – so don’t plan to see Takashi working the sushi bar when the Real are playing. One of the more remarkable and memorable desserts I’ve enjoyed in the past couple decades is Takashi’s panna cotta. 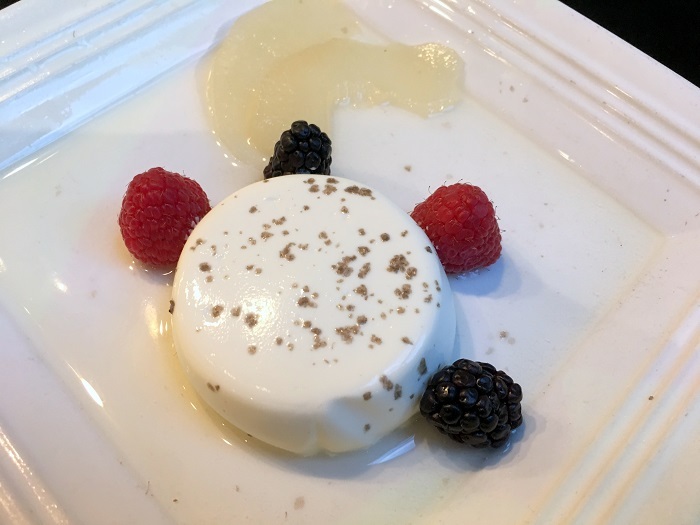 I wouldn’t normally expect to find panna cotta in a Japanese eatery, but this version is unique. It’s made with candy cap mushrooms that, amazingly, taste like maple syrup. So the mushroom panna cotta is indeed sweet, not savory. 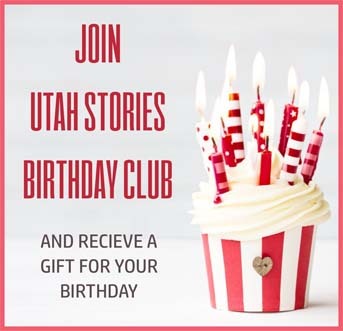 I have said it before and I’ll say it again: In my opinion, Takashi isn’t just Salt Lake City’s best restaurant, it’s one of the best restaurants in the country. But don’t take my word for it, take it from the dozens of folks queued up outside for a table every night.